Thread: JoJo's Bizarre Adventure Part II: Do the Dio Walk! How many of you have watched Jojo? I finished part 2 of Vanilla Ice last week, and it was a hell of an ending. Last edited by Purple Hermit; May 20th, 2015 at 08:29 AM. Oh wow... thread went that long. This thread... Oh what a beautiful Duwang! Anyway, Vanilla Ice episode is awesome, can't wait for Dio's World. Waldorf: You know Statler, after watching the last seven hundred episodes of One Piece, I think I've come to a conclusion. I'm hoping for an awesome final battle with Dio. What the Foo ? Mikitaka seems more legit now. You people voted for Hubert Humphires and you killed JoJo . And I am looking forwards for poses. Lots of poses. And most importantly, this scene. I hope they can get away with this, I've been dying to see this scene animated. 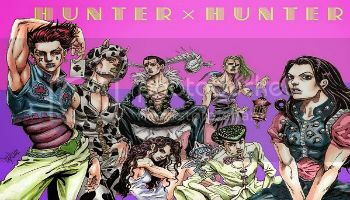 Here's to another decade of JoJo thread! 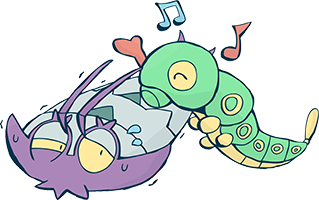 The thread finally died, and what a long life it had. 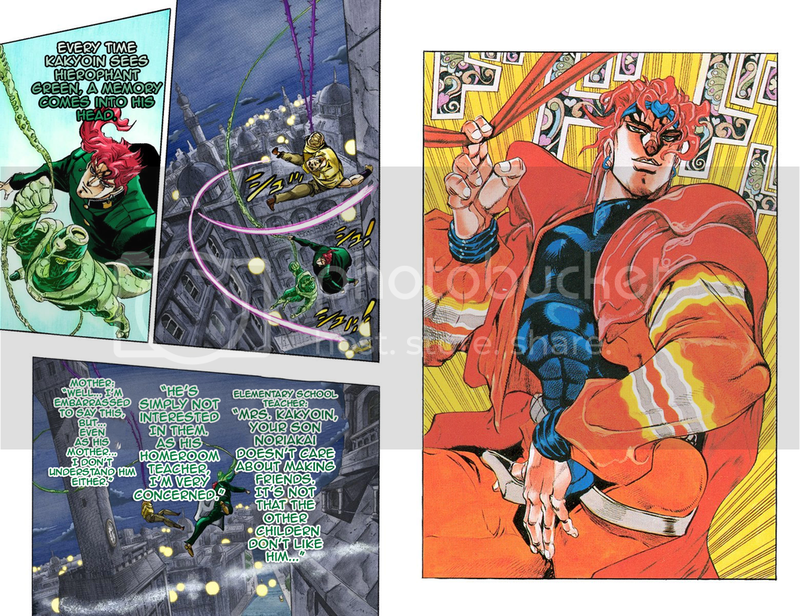 I kind of wish DIO's Part 3 outfit was red rather than yellow. It suits him better, and it brings Char Aznable to mind when combined with his blonde hair. So I haven't read the series since I marathoned Part Duwang a year ago, but now there are high quality scans? With color and good translation?? And now Viz is actually releasing the series in English??? And the anime is awesome???? 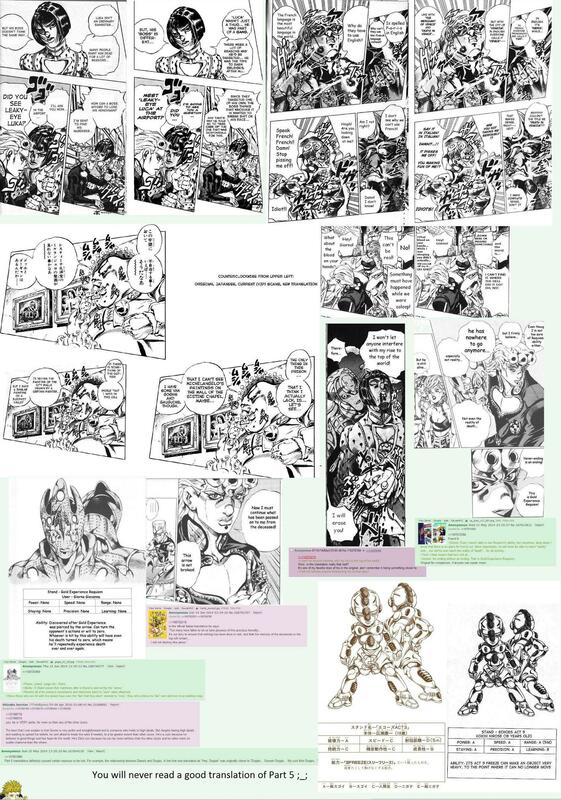 Dare I say it, but now just might be the best time to be a JoJo fan. Regarding Vento Aureo - I'm about two volumes in and loving it so far. JoJo really is unique in all aspects and I can tell that I'm back. I absolutely loved Part 4 and its finale, but I just burnt out after reading the entire thing in two days. 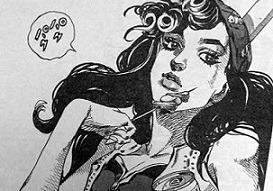 I'm interested to see where this manga develops (I hear part 5 is where Araki's style grows more feminine) and all the crazy Stands I know I'm in for. I'm lovin' it. Oh and the anime has been great as always, I can't wait to see the final fights. Hopefully David just continues to adapt the entire series as well. 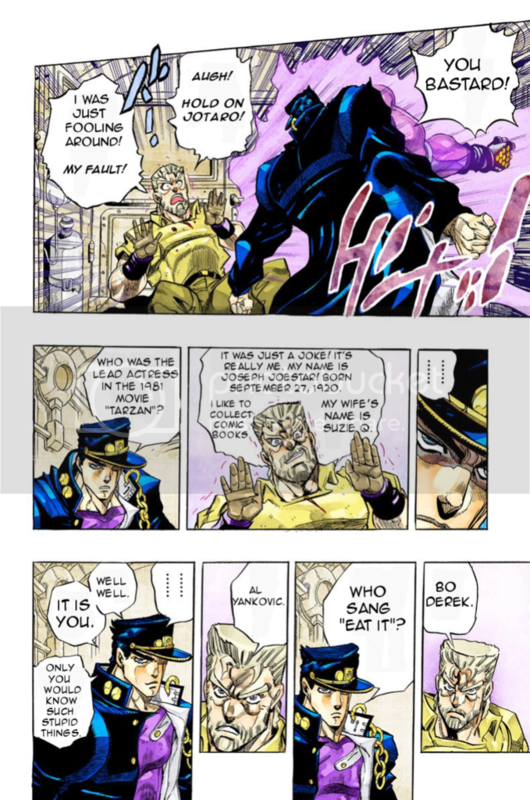 Part 5 would probably be more well-liked in the west if it didn't have such an awful, awful translation, much worse than Duwang (which was at least pretty accurate even though the grammar was hilariously butchered). Behold! It's not even "funny bad" like Duwang, just cringeworthy. Stone Ocean colored on Batoto has a pretty bad translation aswell. I doubt anyone will do scanlations using the color version of the manga. That version didn't please the JoJo fandom as much as the OP one pleased OP fans. 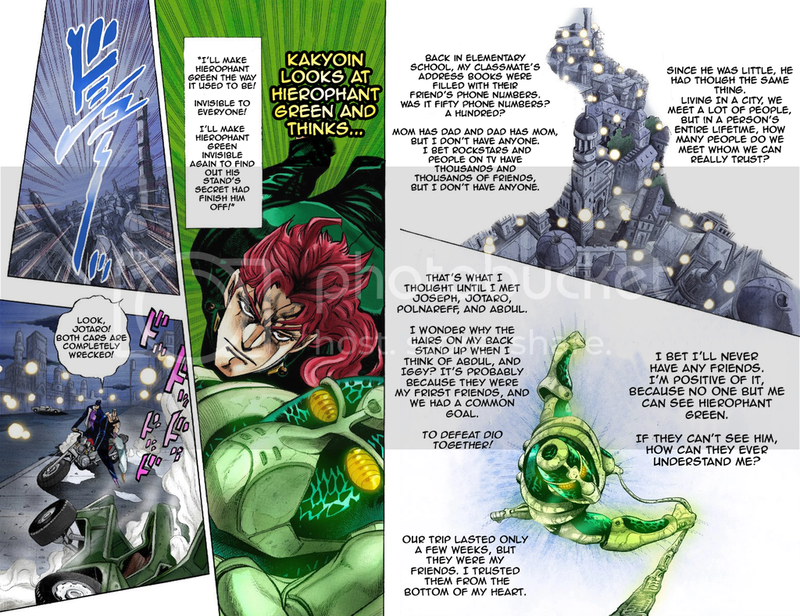 The digital coloring compromises a lot of the art details, so people prefer to see Araki's drawings in all its details than seeing them in color. I like the colored chapter.